Elphinstone Reef is known for its big pelagic fish swimming in the blue. I have been pretty unlucky so far on this reef in that domain. I absolutely LOVE spending time at the top of the reef, at the edge of the North plateau. The abundance of life is staggering. The anthias swarm in their millions, and there is a host of medium predators benefitting from the bonanza. When the current is not too strong, it is a fantastic place to finish a deep dive. Nikon D700, Nikon 28-105 mm macro at 28mm, F8, 1/60th, ISO 200, Ikelite Housing and Ikelite DS160 strobe set on TTL. 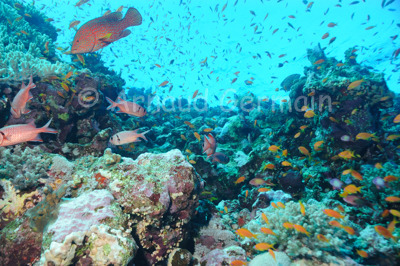 Elphinstone Reef, North plateau, about 10 metres down, Marsa alam, Egypt.